Preschems preservative treatments Polesaver rods and Bioguard bandages protect wooden poles and timber structures from decay, rot and termites. The Preschem remedial treatment systems are technically more advanced than products used elsewhere in the world. The use of our products by power companies has seen the replacement of electricity poles drop to approximately one tenth of the number replaced ten years ago. Virtually all Electricity Authorities utilising wooden poles across Australia now specify and recommend Preschem remedial products for use in their poles. All our timber preservative treatments (wood pole preservatives & DIY wood care) are easy to apply, not dangerous to humans and are environmentally friendly. Preschem has used the well established knowledge of how and where diffusion works to develop remedial treatment products called Polesaver Rods and Bioguard Bandages. Polesaver rods are solid chalk like sticks containing Boron and Fluoride which are used to treat internal decay and are inserted into the pole via abaxial holes. Bioguard contains exactly the same formulation of actives but in the form of a bandage, which is wrapped around the pole below groundline and is used for treatment of external decay. The bandage and abaxial holes should be considered as reservoirs and the chemical remaining is determined by the rate at which the chemical moves into the wood in the pole. The more moisture present in the wood, the faster and deeper the active ingredients diffuse. When the Polesaver and Bioguard reservoirs become empty high concentrations of Boron and Fluoride will have moved into the wood and should remain there for a number of years. The level of moisture required for activation of the chemical is similar to that required for decay to take place (around 20%). If little or no moisture is present the treatment will remain intact until the moisture level rises sufficiently for diffusion (and decay) to occur. Preschem has conducted numerous field trials for Polesaver and Bioguard, which has shown that the chemical reservoirs deplete over 6 months to 3 years depending on environmental conditions. However, chemical analysis of the timber from these trials show that sufficient levels of Boron and Fluoride to control decay exist for up to 10 years from the time of initial treatment. In Australia, it has been shown in practice that these levels are regularly achieved on in-service utility poles over the range of maintenance cycles of 4-7 years. In the field of wood preservation the use of the diffusion or osmosis process to deliver fungicides to control decay has been known for many years. This dynamic process relies on a high concentration of water-soluble active ingredients, known as the solute, moving through a membrane (the cellular structure of wood) to a lower concentration within the wood. The process relies on the presence of a suitable solvent (water) being present on both sides of the membrane. Some compounds contain active ingredients, which diffuse better than others due to their chemical structure. Two of the most proven diffusible compounds are salts containing either water-soluble Boron or Fluoride. It is important that diffusible preservative compounds contain more than one active ingredient so that they can effectively combat the wide spectrum of fungi that attack timber. Commercially the diffusion process has been most effectively developed to remedially treat timber structures insitu and relies on a concentrated quantity of diffusible compound being applied to areas of wood which are capable of maintaining moisture levels above 20%. The critical zone for decay in wooden poles is from the groundline to 500mm below groundline. The wood within this zone usually contains sufficient oxygen and water for decay to become established, but is also the zone where diffusible wood preservatives are most effective. At high concentrations active ingredients from remedial treatments can have a fungitoxic effect (where fungal activity is killed) whereas relatively lower concentrations can have a fungistatic effect (where fungal growth is arrested but doesn’t die). Recognized fungitoxic loadings in wood for both Fluoride and Boron which are contained in Polesaver rods are around 600 parts per million if present individually. When combined there is a synergy that means this level drops to about 300 parts per million. This concentration will kill the broad spectrum of common wood decay species. A synergetic effect is evident when Boron is in the presence of Fluoride, which conservatively means their combined effectiveness is equivalent to the sum of both elemental Boron and Fluoride contents. The result is that fungitoxicity will be imparted to the wood when the combination of either ingredients exceeds approximately 300 parts per million. Fungistatic effects whereby the actives will inhibit fungal growth would normally be expected to impact at levels around half of this value. The other advantage of a dual active preservative is that it will control a broader range of fungal decay. Essentially some species of fungi are more tolerant to either Boron or Fluoride on their own. Having both Boron and Fluoride present means that Polesaver and Bioguard will ensure superior control of a greater number of species of fungal decay than alternative single active diffusible products. Split cores and/or cross-sections can be sprayed with a colourmetric indicator. These can be taken from either full cross cut sections or core samples taken from standing poles. Chemical analysis in a laboratory using sophisticated analytical equipment such as Atomic Absorption Spectrometer (AAS) or Inductive Coupled Plasma (ICP). The most common and economical method used is by means of the application of a colourmetric indicator. The preparation and application of the indicator is to Australian Standard 1605 – 1974 “Sampling and Analysis of Wood Preservatives and Wood Preservative Treated Timber”. The test for Boron commonly referred to as the turmeric test provides a good positive red indication when more than 300 parts per million of elemental Boron is present which corresponds well with the fungitoxic amount required for the control of fungal decay. Levels below this figure will result in a yellow colour remaining. It can be stated confidently that fungitoxic levels of Boron are therefore present when a positive red indicator result is achieved. 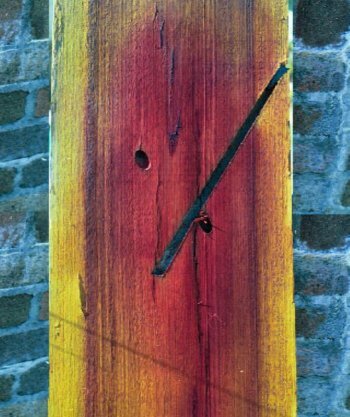 Note: The red colour from the indicator can sometimes be difficult to detect when wood is naturally red or darkened from decay. Contrasts can be further depleted in photographs which as reliant on developing techniques. UV light can be used to help highlight contrasts. Preschem Polesaver Rods and Bioguard Bandage timber preservatives have been designed so that application is clean and safe with minimal chemical contact required during installation This compares to the injection of liquids and gels which are messy and awkward to apply. The treatments do not emit vapour and are odourless. Solid wood preservatives such as Polesaver Rods and Bioguard Bandage that diffuse into the timber are now considered to be the most acceptable to the timber industry. These are the youtube videos to help you understanding wooden pole management.